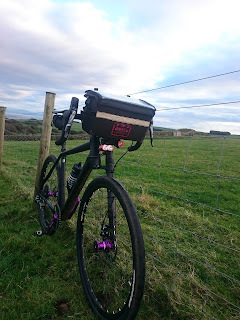 For some reason I've never really understood, my review of my Cannondale Jekyll is still, twelve years after it was first published, one of the most popular posts on this blog. Now, a month after getting my second Cannondale, it's time to review it. How to start? A decade ago, I used to run a 24 hour event across all seven of the 7 Stanes mountain bike courses, and the roads between them. Riders, in relay teams of four, would set off from Glentrool on Saturday morning and arrive in Glentress early on Sunday morning. The only rule was that the relay baton had to be carried by bicycle the whole way. It wasn't formally a race, but in practice, like many audaxes, it really was a race. There was no prize, but every team wanted to be the first team home. 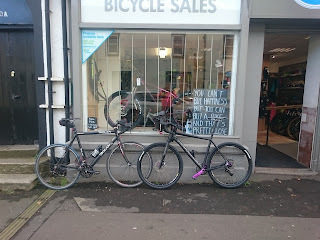 Because the route was a mix of gravel roads, tarmac roads and extremely technical mountain bike trails, teams brought a selection of bicycles: cross bikes for the gravel roads of Glentrool, cross country mountain bikes for Kirroughtree, Dalbeattie, Mabie, Ae, Newcastleton and Glentress, and race bikes or time trial bikes for the roads in between. But on one of these events one team brought a bike that interested me greatly. It was a Cannondale Silk Road - a road bike with Cannondale's 'Fatty' suspension fork technology. The fatty fork had the suspension movement inside the head tube of the frame. The Silk Road put in very good performance both on gravel and on tarmac. The Silk Road series was not commercially successful; by the time I saw it the bicycle was no longer in production. But for the back roads and unmetalled tracks of Galloway, on which I do a lot of riding, it struck me as a near ideal vehicle. Earlier this year my beloved Dolan cross bike started to die. It is twelve years old, and the bottom bracket, which is worn out and creaking horribly, has seized in the frame. I considered my options. One option was the Cannondale Slate. It would be hugely expensive, and was obviously not the most practical option. But the idea of a road bike with a little bit of suspension really appealed. The Slate is the spiritual successor to the Silk Road. Like the Silk Road it has front suspension, this time using a short travel Lefty monoblade. I like lefties; I may have mentioned this before. They work exceedingly well, and they're just elegant technology. It also comes with unusually high volume tyres on smaller-than-normal wheels. Every review of the Slate that you can find online criticised these tyres; I'll come back to them. But I was aware of them as a potential problem. Nevertheless I may have slightly overpersuaded Gareth Montgomery to get a test bike in to ride. The bike he got in was the base model, which comes in green with Shimano gears. I took it out for a wee ride on the road. It was faster and more responsive than I'd expected, and climbed extremely well. I didn't take it off road because it was a split-new demo bike, but I liked it. Over the past month I've ridden it about 300 miles, probably three quarters on tarmac. That's not a lot to evaluate a bike, so this is necessarily a first cut at a review; I'll probably write a more considered one later. 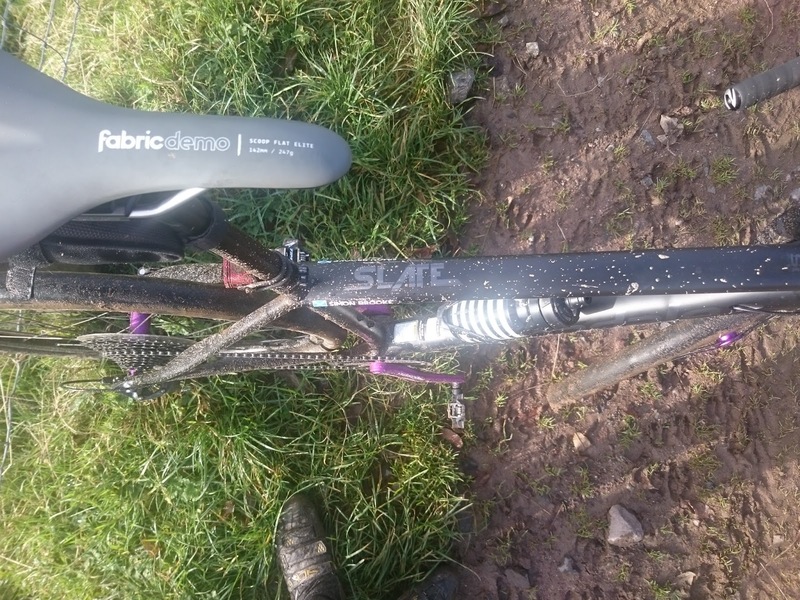 I've mentioned the lefty fork and the tyres above; the third significant idiosyncrasy of the Slate CX1 is that it has SRAM CX1 groupset, and, specifically, a single front chainring driving an extraordinarily wide ratio eleven speed cassette. This means that the bike actually has fewer gears than any bicycle I've owned since 1980. How does this very unconventional bike work in practice? On road, this is a remarkably fast road bike. I didn't really expect that; I thought the big tyres would be draggy. Because of that expectation I originally ran the tyres at 60psi, which although low for a road bike is high for these tyres. They aren't draggy, at least not at 60psi; on the contrary, the bike rolls extremely well. I've found it reasonably easy to sustain twenty miles an hour on the flat, and I'm old and not very fit. Whether it's quite as quick as my road bike I'm not certain, but I think it pretty much is. On climbs, there is a little movement of the lefty, particularly when you're out of the saddle. This isn't problematic. You can lock out the lefty when climbing but I've rarely felt I needed to. Just look at the size of that bottom gear! The gears? I'm still not used to having only a single derailleur; I still instinctively try to put the bike onto the big ring. But I've found the 'double tap' mechanism very easy to adapt to. On road climbs the gear range is more than adequate - the lowest ratio, 44/42, is extremely low. At the other end of the scale the highest is 44/10, which is not far off the 53/13 of my road bike. Yes, you do ultimately run out of gears on a descent, but you're probably at a speed where tucking down and being as aerodynamic as you can is more efficient than pedalling. The benefit of the single chainring setup is that the gears are remarkably quiet in use; it also seems very unlikely that the bike will suffer from dropping the chain, and despite the length of the derailleur arm chain tension seems very well controlled - I've not had any issues with chain slap. Obviously, with only eleven gears, there are quite big gaps. But is isn't as bad as you'd think. There's no overlap between gear ranges, and those gears are reasonably spaced. I hadn't expected I'd ever have to change either up or down two gears at a time, but in practice I frequently do. I haven't had a problem finding the right gear for a comfortable cadence. The limited suspension travel is rarely noticeable in itself but even on poor tarmac there's no road buzz. I initially assumed that the fork was doing very little on good tarmac, but by regularly resetting the rubber o-ring and checking its movement I find that the bike regularly uses at least two thirds of its 30mm travel even on the best of roads. It's very comfortable, and doesn't seem to have any negative effect on speed. How can I say how nice hydraulic disks are on a road bike? My two most scary moments on a road bike have been down to inadequate brakes. On an audax to Lindesfarne I was descending a steep twisty back-road hill with the instruction 'straight on at crossroads'. What the route sheet didn't say was that the road we were about to cross was the dual carriageway, seventy mile per hour, A1. That was on a Raleigh with single pivot Weinmann brakes. I stopped in time. Barely. The second was on the Exmouth Exodus, an overnight ride from Bristol to Exmouth. I was on my Dolan cross bike. We arrived at the top of the Cheddar Gorge in a torrential downpour. The road was a river, and the Frog Leg cantilever brakes on the Dolan - which until then I'd thought pretty good - essentially didn't work at all. A lot of other people's brakes didn't work well either, which contributed to the scariness of the descent, but that was not a good experience. I haven't yet tried the Slate's brakes in torrential rain, but I'm confident they will work well. In everything I've done so far, they've been powerful, smooth, progressive, reliable. Of course, modern dual pivot calipers are also fairly good, but they're still working on the brake track which will be very wet in heavy rain. Hydraulic disks are just much, much nicer. Overall, on the road, the Slate is an extraordinarily nice bike. It's distinctly better on road than I expected - I had expected that the specialisations which allow it to work off road would compromise its on road performance. They don't. Off road... well, it's those tyres. When I originally had the tyre pressures at 60psi, I thought they were suicidally sketchy. On damp off road surfaces there was virtually no traction. The rear wheel would slip instead of drive, and the front would slide sideways with startling ease. The bike has excellent handling and is very controllable while sliding; I haven't fallen off it yet. But at 60psi a damp bend off road needs to be negotiated with care and not much speed. Fortunately the tyres will run a lot softer. I've now dropped them down to 45psi, which doesn't seem to have had a noticeably negative effect on on-road performance but has improved off-road significantly. 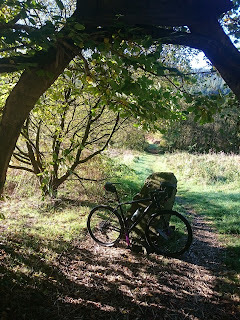 The tyres are still sketchy, and don't like either mud or loose gravel, but it no longer feels actively dangerous. I still don't feel comfortable descending fast off road. The chassis would happily go faster, but the tyres let it down. I could run the tyres softer yet; tubeless, they'll go down to about 30psi. But judging from other people's reports, at that pressure the on-road performance is significantly compromised. This isn't, of course, the first time Cannondale have let a fine bike down with a poor choice of tyres. I think I may have mentioned the dreadful Hutchinson Scorpion Airlights that my Jekyll came with. By fitting light tyres, Cannondale make their bikes seem lighter in the shop. But if those tyres aren't really up to real-world conditions, it's a pretty illusory lightness. Having said that, other reviewers have complained that the tyres supplied on the Slate are excessively fragile, suffering from sidewall rips too easily. So far I haven't had any problems of that nature. I've picked up one slow puncture, but considering how often I've been off road that isn't dreadful. This isn't a mountain bike. The suspension travel is short; to descend comfortably off road you need to be out of the saddle. But then you probably do anyway for control, so it's not a big issue. It's not a bike that you would take fast on rough singletrack; its low-speed stability and agility aren't as good as a mountain bike, and the suspension travel is limited. However, it would manage singletrack, and on dirt roads be sufficiently faster than mountain bikes that overall it would probably keep up. Hope supplied prototype hydraulic in-line levers to some of their sponsored riders this year, and apparently they're compatible with SRAM, so (if these go into production) that may be an upgrade I'll make. you were this: dead wrong. I'm not entirely certain what I'll do about the tyres. 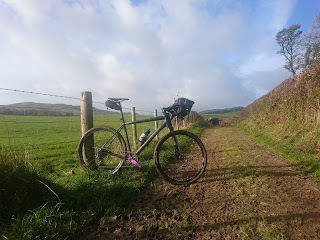 The Cannondale slicks are superb on road, and anything which provided decent amounts of mud grip is almost bound to compromise that. On the other hand, for me reasonably safe off-road performance is as important as fast on-road performance, so that's a compromise I'll probably make. Ted King, who won the Kanza 200 this year on a nearly-stock Slate CX1, used Schwalbe G1 tyres, which look as though they would roll fairly well on tarmac. On the other hand, his conditions were fairly dry. Something with more tooth, especially on the shoulders, would be nice, but it's hard to find in 650b x 42. I think the Slate is probably a very nice off-road bike, too, but at present its performance is limited by the very sketchy tyres. I think that finding the right tyres with the right compromise between off-road traction and on-road rolling will make the difference between it being a nice bike and a superb one. This is an expensive bicycle, and you'd jolly well expect it to be well presented. And it is; the frame is made to Cannondale's usual very high standard, and finished in matt black with gloss black lettering. The wheels feature purple anodised hubs, and the crank-arms are a matching purple. It provides a nice visual highlight to the presentation. But two minor points let this down. Firstly, all the purple-anodised parts are Cannondale own-brand. There's one other anodised part on the bike: the control knob on top of the Lefty. 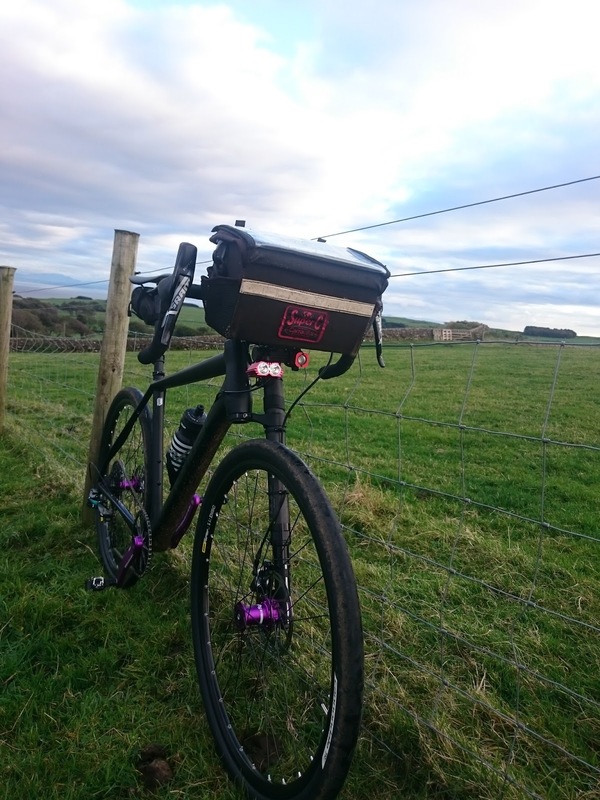 It is also, obviously, Cannondale proprietary, and you'd have thought it would have been obvious to supply it in a matching purple; but no, it's red - the only red detail on the bike (well, my lights are also red anodised, but they didn't come with the bike). So from a purely visual design point of view I feel they missed a trick there. as new after about 30,000 miles. The other issue is to my mind more serious: at just 300 miles, the anodising on the crank arms is already beginning to wear through. Now, obviously, things wear; crank arms rotate and I'm clearly habitually brushing the crank with my ankle as I pedal. But the photograph on the left shows the crank of the Slate, where the pretty purple anodising has already worn through, in front of the equivalent crank of the Campagnolo Chorus chainset on my road bike, which shows no obvious wear after twelve years and approximately 30,000 miles. 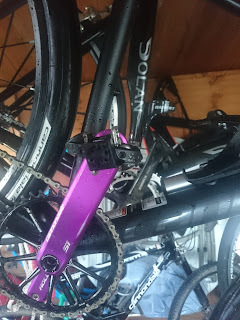 I like the purple cranks; I think they're a nice detail. But I don't think this is good enough quality for a bike at this price. If the anodising can't be made durable enough to last a little longer, it would be better not to anodise. I've been quite critical in this review. That doesn't mean I'm unhappy with the bike, or that I think I've made the wrong choice. It is both fast and comfortable on road, making it an excellent bike for audaxes and sportifs. Even with its present tyres it's reasonably capable off road, and I've been very much enjoying being able to mix road and off-road riding. When I first rode it, with the tyres at 60psi, I thought Cannondale were being irresponsible selling the bike in the British market with slicks. At that pressure - which would be normal on a cross bike - the slicks are so sketchy as to be actively hazardous off road. But I no longer think this since the tyres roll well at much lower pressures than I'd anticipated. Nevertheless, they are very poor tyres off road. Of course, a partial answer to the tyres problem is to have two sets of wheels, one for on road use and one for off. I had that setup on the Dolan cross bike. But changing a lefty front wheel is not as quick as changing a quick release; and in any case you cannot take a spare set of wheels with you when you are out, and what I want from this bike is very much the ability to mix on and off road riding. I need to find better tyres. Note that my criticism of the tyres is entirely about their performance off road (and, specifically, their lack of grip in wet conditions). On road, they're fine - comfortable and very fast rolling. If you're thinking of buying a Slate for on road use, don't be put off by my criticism of the tyres. It is - as I expected it would be - incompatible with my current trailer, so it can't (yet) be used for camping or for shopping trips. Also, because the wheels aren't quick release, it doesn't fit easily into a car. Those problems can be solved with a new trailer and a bike rack for the car. And they will be solved, because I'm confident this is going to become the bicycle I choose to use, not just for big adventures but also for everyday rides.